Jones Auto & Towing provides Lithia Florida tow truck services quickly! Speak to us at 813.299.7000 for immediate assistance. Jones provides towing service including flatbed service, emergency roadside assistance, wrecker service, and even impound service to Lithia and other nearby Florida areas around Tampa. Jones is the best option for speedy, cost-effective and honest wrecker service around the Lithia, Florida and Greater Tampa Bay area 24 hours a day, seven days a week. We provide wrecker service ready for 24 hour roadside assistance or service, emergency towing, fuel delivery, flat tires, jump starts, vehicle lockouts, and much more. There is not a whole lot we’re NOT able to help with when it comes to the car, trucks or sport utility vehicles – and further even motorcycles as well as motorhomes! What ever your needs actually are, we are able to assist you. Simply call us at 813.299.7000 or leave us a message via our contact page. What does Jones do? Practically everything! 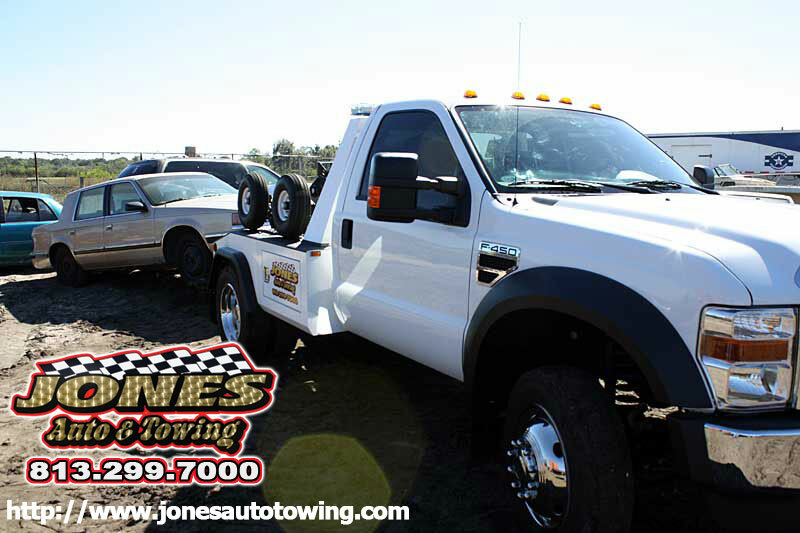 Since 1995, Jones has been offering you top quality tow service throughout the greater Tampa area. By way of serving our local neighborhood friends to vacationers and travellers making their way through Florida, Jones is continuing to grow together with the area! If you can’t see the thing you need down the page, phone us – if WE can’t supply the services, we are happy to direct you to a company that can – but there are hardly any occasions you’ll ever really need to do that! Our tow trucks and service gets terrific ratings online and deservedly so! Excellent services and attention to details are a couple of things we fully pride ourselves on! A few things that folks call Jones Auto & Towing services for: roadside service, recovery and removing abandoned vehicles or junk vehicles, vehicle towing, light or medium duty tow services, local area car tow, flatbed towing / trucking, motorcycle tow and transport, general wrecker service, and private property impounds. Jones works with insurance providers, salvage auctions, tow and transport services to work with damaged and wrecked cars and trucks, and vehicles subject to an insurance claim. Jones is locally owned/operated tow company serving the Lithia FL area. This is definitely a limited list of services. Jones has been in business since 1995. Even if we don’t list it right here, odds are still really good we actually do deliver that kind of service. Contact Jones at 813.299.7000 to learn more. After hours emergency towing is at a higher service rate. Jones Auto & Towing can provide emergency roadside assistance and roadside services anytime you need it. We completely understand how upsetting a breakdown on the side of the road might be – and the very last thing you want is to be hanging out there waiting for hours. Jones is THE tow truck service to contact in the Lithia FL area for prompt service. Jones maintains top-notch tow truck safety equipment and standards. We back up our promise on a daily basis to give each and every client the very best quality help and safety when we provide any type of towing service! We guarantee it. Jones Tow Truck Service provides roadside assistance, jumpstarts, handles lockouts, gas delivery, tire changes, and general towing services for any need in the Riverview FL and surrounding areas including the Greater Tampa FL area. How to Know if Your Towing Experience Is Efficient? Car Accidents: How Prepared Are You? Jones Auto & Towing services will also buy old or junk cars in Tampa and surrounding areas. If you have old, junk or wrecked vehicles, then call Jones to get rid of them fast. We'll send out a tow truck, pick it up, and and give you CASH MONEY on the spot! Don't PAY to get that junker gone - SELL your Tampa junk car for cash TODAY! © 2019 Jones Auto Towing.